The reassurance of a static garden, where everything is clipped and controlled and clumpy, can never compare to the thrill of a place which includes plants that, energized by the elements, scintillate and shimmer. The more restricted the space, the more imperative it is to liven it up. Tall grasses are some of the most animated of plants. Of these, varieties of the blue moor grass, Molinia caerulea, offer a comprehensive range. Each has its own personality and best uses. All Molinia start blue, purple and green but change to gold in the autumn. This late transformation is especially effective when back-lit at dawn or dusk. Stems and seed heads glow as though imbued with some internal light. Molinia caerulea ssp. arun-dinacea Windspiel (Wind Games) does just what its name denotes, moving playfully this way and that with every breeze; given its head in a broad border, it animates the scene. The aptly named Transparent is just as big, but it has such a dainty demeanour that it would not be out of place in a small space. As the name suggests, it is see-through and a host of other plants may be accommodated around its skirts. Its elegant, arching stems twinkle with thousands of tiny flowers and, as they turn to seed, the tips of the stems bend even closer towards the ground. Molinia caerulea is happiest out in the open. For a light touch in a shady place, there is the wood mellick, Melica uniflora, with dainty inflorescences composed of small individual flowers. Many grasses have a dreamy insubstantiality which defies definition. A meadow in full flight is a sea of lilting movement, without focal points. In a garden, this effect can be harnessed in smaller areas with a limited palette of plants. If you were keen to ring the changes and prefer to use annuals and tender plants, small dahlias could mix with Hordeum jubatum sown directly after the dahlia tubers have been planted. The two will intermingle happily, the foxtail barley moving gently, now exposing the flowers, now obscuring them with an almost filmic quality. One vernacular name for Stipa arundinacea (syn. Anemanthele lessoniana) is tress grass, because of its long, soft inflorescence. Planted on top of a wall or in a tall pot, the grass can demonstrate this characteristic most effectively, its long, soft flowers floating down to ground level like Rapunzel’s locks. Another name for this plant is pheasant grass. Its blades, like the bird’s plumage, are a lustrous mixture of olive green, henna red and bronze. In shade its colouring is more subdued, though still rich. In full sun, given good soil, it is at its most vivid. Despite its antipodean origins, in thin, dry soils, many blades may dry out, giving its tussocks a desiccated look. In such soils incorporate plenty of humus at planting time. 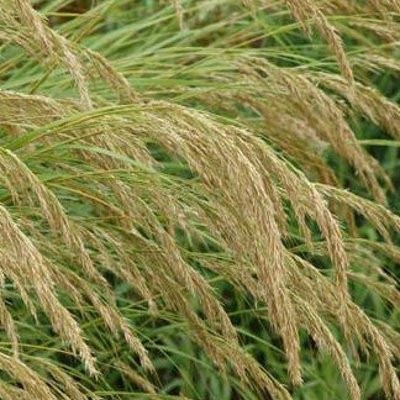 Stipa arundinacea is evergreen and as with all evergreen grasses, it should never be cut back. Teasing out dead stems is the best way to deal with excessive thatch and old flowers. Even when they do not result in death, drastic haircuts will maim evergreen grasses. Stipa gigantea sometimes loses all its basal foliage during the winter. Even when it retains a central clump of greenery, all the dross from the year’s growth should be pulled away. This is a plant of sun-baked Iberian hillsides. Its common name is Spanish oats, and though it will tolerate cold winter temperatures, it will turn up its toes if expected to put up with wet feet too. Although its tall, stiff stems are magnificent at the end of the season with their branching heads transformed to gold, it has more mobility and grace earlier in the year. The first flower buds start to emerge as the weather warms up. It is at this stage you dash out to count them and anticipate the glory they will soon provide. As the stems lengthen, the tightly packed inflorescence pulls itself from the fattened flower stems like some emerging insect, lengthening and shaking itself out until the long, drooping panicles are released and shake their willowy heads freely in the soft summer air.